“The resurgence has slightly surprised me, to be honest. I didn’t expect to see Motorola come back in a meaningful way, but it actually has,” said Nick Spencer, senior practice director at ABI Research. “If you’d asked me about Motorola a year ago, I would have said it was on a distinct trajectory towards oblivion,” he said. Motorola’s turnaround can be attributed only in part to Google, which announced it would buy the handset maker three years ago this week. The deal gave Motorola a new lease on life, but Google operated Motorola largely at arm’s length, and it now plans to sell the division to Lenovo. 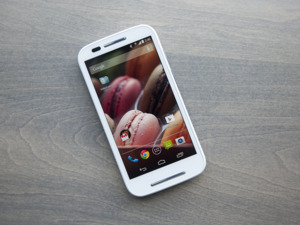 But thanks to the Moto G, the LTE version of that phone and the Moto E, Motorola’s sales have turned a corner. The company apparently hit on a winning formula, offering phones at lower prices but with features good enough to please many consumers. “As the market for flagship smartphones has softened and a lot of people are looking at buying devices without a contract, Motorola’s Moto E and G seem to have really captured the moment,” Wood said. The strategy to pair decent specs with a low price isn’t the only reason for Motorola’s comeback. Avoiding the cluttered interface found on many other Android products also helped, according to Roberta Cozza, research director at Gartner. And while the U.S. remains an important market for Motorola, traction in India and a return to Europe have also lifted its sales. “Motorola is doing well right now, but other vendors are observing its success with great interest. You can expect to see a slew of affordable Android devices from the major brands during the rest of the year,” Wood said. Samsung has signalled it will increase its efforts in the low end of the market. The company is still the world’s biggest smartphone maker, though it had a difficult second quarter. Local stars like China’s Xiaomi and India’s Micromax have, like Motorola, benefitted from the growing popularity of affordable phones. Though for Xiaomi, at least, converting the positive attention it’s received into a thriving international business will be a challenge, according to Wood. “That segment of the market is very saturated, and it’s just tough to stand out,” Cozza said. But he added that there may be more openness to trying Android devices from brands other than Samsung. How the future will play out under Lenovo remains to be seen. The acquisition is still going through regulatory approvals, but it’s expected to close by the end of the year. “Lenovo arguably made a very astute move to acquire Motorola at the time it did,” Wood said. Since Microsoft bought Nokia, it has had to lay off workers and cut costs to get the company back to profit, he said. “Google has been through a lot of that pain,” Wood said. Motorola may be losing money, but it’s now a leaner company focused on a vibrant part of the market, Wood said. The challenge for Lenovo will be to find the right branding strategy. When it bought IBM’s PC business 10 years ago, it had only the Think brand to deal with, which had a solid reputation. This time, Lenovo has to square its own Vibe brand with the Moto brand, and decide how to use the Motorola name. One thing is for sure: Lenovo can’t waste time on a long integration process if it wants to build on Motorola’s comeback. It needs to keep the company’s supply chain working smoothly, and it should follow through on Motorola’s road map rather than waste time rethinking it, according to Wood. Lenovo should also be careful not to take too much cost out of Motorola’s products, because “the color, material and finish on Motorola’s devices is exceptional for the price point,” Wood said. “When I’ve compared it to some of Lenovo’s own Android products, they don’t necessarily reach such a high bar,” he said.